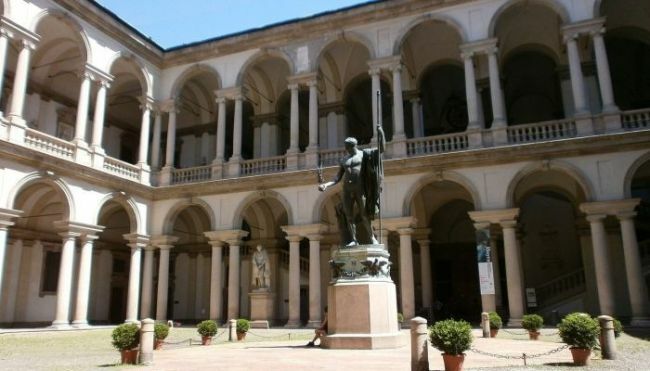 MILAN (AP) - Restorers at Milan’s famous Brera Art Gallery have taken measures to protect the collection after its humidity control system failed during a “once-in-a-decade” dry, cold spell that moved through Milan last weekend, officials said. Donato Bramante’s “Christ at the Column” and a Bastiani piece were removed from their exhibit spaces for immediate stabilization and 40 other artworks were patched with protective Japanese rice paper to ensure their paint surfaces didn’t crack under the drier humidity conditions, museum director James Bradburne said. “A horrible thing to happen, but happily no paint loss, and nothing irreversible,” he said in an email. Humidity levels in the museum plunged last weekend when a “perfect storm” dry spell moved through Milan with high winds that overwhelmed the humidity control system that draws air into the gallery from the outside, he said. Museum officials immediately moved in mobile humidifiers and started applying the rice paper patches onto the works. The paintings affected are only works on panel, many of which were already slated for restoration, he said. Some, including Piero della Francesca’s “Pala di Brera,” will have the patches removed as early as Monday to determine if they need further restoration. “The climate has been stable since mid-last week and we will soon be able to have a complete picture of the impact,” Bradburne said. He said the museum would be preparing a full report on the situation, with an eye to preventing any similar episode in the future. The Brera Gallery is housed in an imposing Baroque palazzo that also is home to several other Milan cultural institutions. The gallery, founded in 1809 alongside an art academy, today counts many masterpieces in its permanent collection, including from Tintoretto and Raphael.